On the streets with the last from the candidates for County Executive! NOW DO NOT FORGET TO VOTE! Would like to thank everyone, especially the advertisers that are really starting to step up and help with all aspects of the Lakewood Observer! Maggie Good work! This issue kicks off Kids Corner with a trip to the Lego Museum by Paul Kompier! LEAF Community's 4th Annual Harvest Festival Oct 20! Wow times flies! A report of the District 2 Council Debates! NOW DO NOT FORGET TO VOTE! 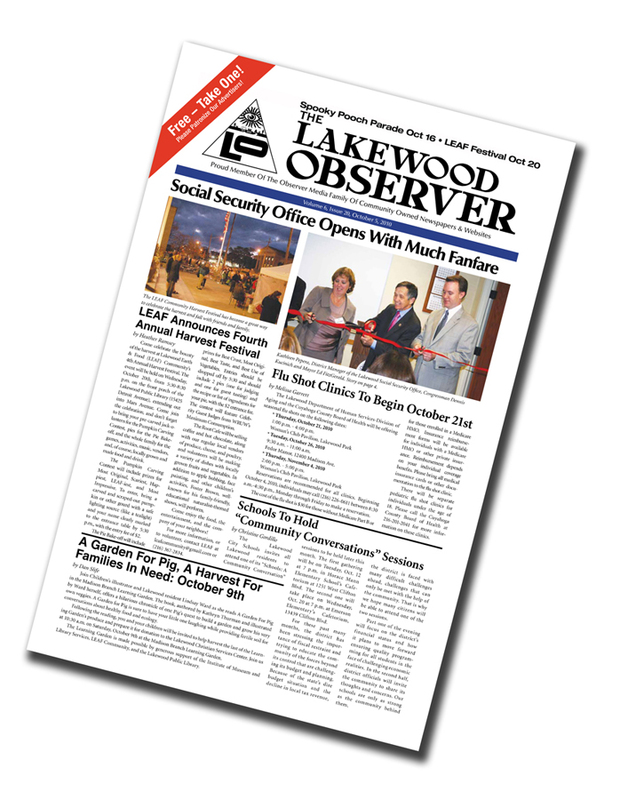 Lakewood Times celebrates 90 years old with new website! AND OF COURSE The Calendar Page by Mel Page! Thank you to everyone, really this has just been a great year so far, and getting better! Re: LO 06_20 On the Streets! LEAF Community Festival Oct. 20! Sorry Jim, but you left out the best part... the Lakewoodites cartoon on the back. Like Smokey said, "I second that emotion."